If you’re in the market for an inground fiberglass pool, you’re probably looking for a single resource that lists the most prominent fiberglass pool manufacturers in America. 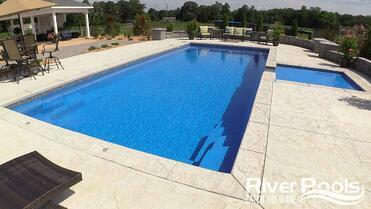 As a manufacturer of inground fiberglass pools, we are often asked our opinion of other manufacturers. Because we believe strongly in answering the questions we are asked, we put together the following list of 10 of the most prominent fiberglass pool manufacturers in America in alphabetical order. As you vet the various manufacturers, please remember that although buying a high quality pool shell is essential, it is only half of the equation. The local pool company with whom you will actually do business is responsible for properly installing the pool and providing exceptional service. If you'd like a reliable guide to assist in researching your local pool contractors, check out our Ultimate Pool Builder Vetting Checklist. Alaglas Swimming Pools is located in St. Matthews, South Carolina, and touts 25 years of experience and a 50-year warranty. Some of Alaglas’ popular models include the Atlantis, Antigua, and Majestic. With its roots in Australia, Barrier Reef Fiberglass Pools has a manufacturing facility centrally located in South Carolina. According to their website, they have built their reputation on quality control and superior color technology. Some of Barrier Reef’s fiberglass pool options include the Whitsunday and Coral Sea models. Barrier Reef also has a sister brand, Riviera, that is offered to pool builders through distribution, which enables builders to purchase pools without necessarily being a formal dealer. Blue Hawaiian Fiberglass Pools is owned by Viking Pools, a subsidiary of Latham Pool Products, Inc. This acquisition took place in 2010. Blue Hawaiian offers a limited lifetime warranty and some of their more popular models include the Cape Cod, Lexington, and Three-Moon Bay. Leisure Pools is an Australia-based manufacturer of fiberglass composite swimming pools with a manufacturing facility located in Knoxville, Tennessee. Some of Leisure Pools models include the Eclipse, Pinnacle, and Riviera. Imagine Pools, a sister company of Leisure Pools (according to Pool and Spa News), is manufactured at the same facility in Knoxville and offers a variety of models including the Inspiration, Mirage, and Freedom. San Juan Pools has been in business since 1958 and has numerous manufacturing facilities with its corporate office in Lakeland, Florida. San Juan offers a 25-year structural warranty. Some of San Juan's models include the Luxor, Taj Mahal, and Pleasure Island. Sun Pools, located in Albany, Kentucky, offers features such as swim out seating areas, perimeter waterline tile, and a non-skid surface on the floor and steps. Sun Pools offers a lifetime structural warranty and some popular models include the Costa Rica, Tropic, and the St. Thomas. Tallman Pools has over 50 years in the swimming pool industry and is located in Jonesboro, Georgia. They offer a 50 year structural warranty and have over 50 models to choose from including the Majestic, Paradise Bay, and Grand Cayman. Thursday Pools, located in Fortville, Indiana, has a newly expanded manufacturing facility with the capacity to produce big numbers. They offer a lifetime structural warranty and some of their most popular models include the Goliath, Little Bob, and Wellspring. Trilogy Pools, also owned by Viking Pools, offers a limited lifetime warranty and has a variety of models including the Gemini, Genesis, and Hyperion. According to their website, Viking Pools has plant locations in West Virginia, California, Texas, Florida, North Carolina, Tennessee, Louisiana, and Illinois. Viking Pools is a subsidiary of Latham Pool Products and offers a limited lifetime warranty. Some popular Viking fiberglass pool designs include the Ocean Breeze, Cancun, and Caribbean. We hope you've found this helpful and wish you well on your journey to find the perfect pool for your family. If you'd like to learn more about our fiberglass pools and what sets us apart as a manufacturer, visit our Learning Center and Pool Designs Page. Editor's note: This blog article was updated on January 7, 2019.